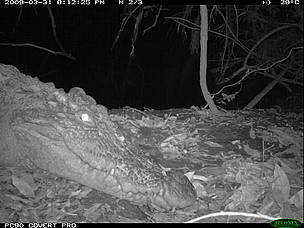 Siamese crocodile captured by a FA/WWF-Cambodia camera trap in Mondulkiri Protected Forest, northeastern Cambodia. The Siamese crocodile is considered one of the world's most endangered reptiles in the wild. The Mekong River basin and wetlands in Cambodia appear to hold the only remaining wild populations, and even these are fragmented and depleted because of hunting, human disturbance, and habitat alteration. 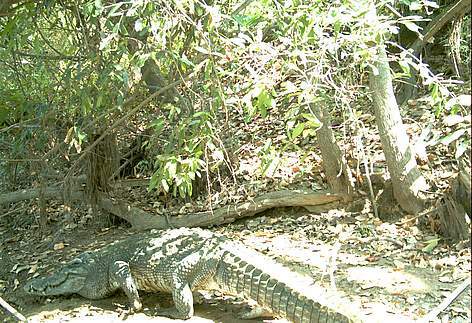 Past surveys have found populations in Cambodia’s Cardamom mountains as well as along the Mekong mainstream north of Kratie, and a WWF-led survey is underway to estimate crocodile population size along the Srepok River in Mondulkiri Protected Forest. These survey indicated that between 100 and 300 wild adults may remain in Cambodia. With more information on population size and status, there is hope that the Siamese crocodile might have a chance of survival in the wild. Siamese crocodile portrait as captured by an infrared camera trap in Mondulkiri Protected Forest, northeastern Cambodia.